After the expected long pause for fact finding, finding of facts and general dithering, the UK government yesterday revealed details of its promised ultra-low-CO2 car incentive scheme. Was it worth the wait? Well, yes it was. Starting in January 2011, buyers of electric cars, hydrogen fuel-cell cars and plug-in hybrid cars will be eligible for a 25 per cent contribution from the taxpayer, capped at £5,000. The discount is offered per vehicle, rather than per buyer, so if you buy a pair of electric cars – one to drive while the other is charging, say – then you will qualify for two discounts. The key word repeated in our laboured sentences above is “car”, as opposed to “vehicle”. Quadricycles don’t qualify. So potential buyers of Reva’s G-Wiz electric runabout – that rare and probably now endangered breed – needn’t bide their time till the New Year to make their purchase as there won’t be any fiscal easing on offer come January. In short, the rules are great news if you are, say, a large established car maker with a big, complex product in the final stages of buffing – Nissan Leaf, Vauxhall Ampera, Renault Fluence, Plug-in Prius, roll a step forward. 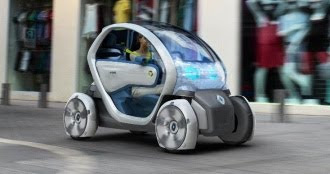 Equally, the rules are bad news if you are, instead, a small, niche electric car maker with a small, fragile, slow but simple product already on the market – tough luck Reva G-Wiz, Aixam Mega City, EuAuto MyCar and Tazzari Zero. If you ever doubted that our government prefers big businesses to plucky startups, get real. Other nuggets of note? ECC’s converted Citroen C1, the Evie, will scrape through the criteria. Mitsubishi’s marvellous i-Miev will qualify with ease, as will its clone-brothers the Citroen C-Zero and Peugeot iOn. Unfortunately, Renault’s tandem two-seat Twizy, which we fully expect to be a disruptive, breakthrough product when it ships next year will not qualify. Bad decision, Olev. Still, there will be a general election in the UK between now and the start of the scheme, so nothing here is etched in silicon. Perhaps the next government will have other ideas about the kind of cars it wants to encourage to flourish on our city streets.